I’ve always enjoyed cooking. I enjoy it even more since I discovered that for some unexplained reason, the kitchen is just about the only place I can play my vast collection of heavy rock tunes, without the ear-splitting volume giving rise to vociferous complaints. It’s a simple trade off. The girls eventually get a reasonably edible meal, while I get to whirl round the stove for a couple of hours, playing air guitar to Motorhead and AC/DC - brandishing a paring knife. What could possibly go wrong? Well in the case of my Wholegrain Mustard Roast Potatoes – very little, I hope. They’re the perfect accompaniment to any traditional meat dish - including stews, but are probably best enjoyed aside your Sunday roast, with lashings of rich gravy. Oh, this is the recipe by the way. All three lines of it. Enjoy. But be careful with that knife! Cut required potatoes into roast size chunks. Do NOT part boil. Instead, transfer to a large bowl. Douse the potato chunks with generous splashes of Henderson’s Relish (or Worcester Sauce - if you don’t have access to this wonderful Sheffield based condiment!) Add 2 or 3 tablespoons of wholegrain mustard, mix well, cover and marinate. Anything from 1 to 4 hours. The longer they stand, the more eventual flavour of course. Heat oil in a roasting dish at 220c / Gas Mark 7. Once hot, add the potatoes and wholegrain mix, then roast until dark and crispy on the outside and soft and fluffy in the middle just like the ones in the pic. Happy cooking! I hope to be back in the Hard Rock Kitchen after my holidays, with my favourite Greek Dish – Lamb Kleftiko. P.S. 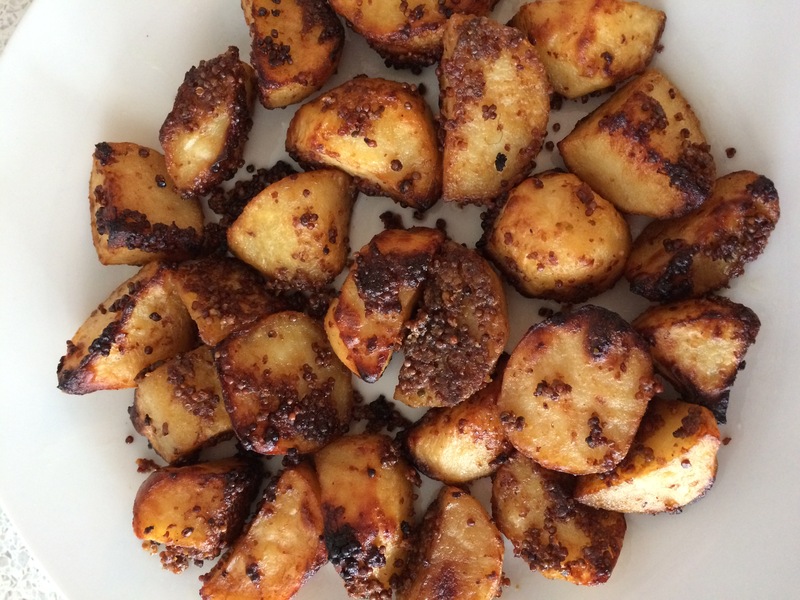 If you do have a go, send us a picture of your roasties at https://twitter.com/GetCarterRadio. We'll give you a cheeky mention & follow!